With The Barrow now out and available for a couple of months and reviews coming in, it occurred to me to begin using my blog on Sword & Barrow as, well, a blog. So I’m planning on posting a series of mini-essays on different aspects of the book, to write about inspirations, antecedents, and writing strategies that influenced or appear in the book to help give readers some context, points of discussion, and hints of things to come. Be warned there will be some mild spoilers on occasion, so proceed at your own risk. I figured I would start at the beginning of the book, which I suppose only makes sense (and here I mean the physical beginning of the book, as opposed to its roots in a screenplay, which I may eventually write about later). There are a lot of themes which run through The Barrow, a lot of things that are being referenced and played with, and one of them is the now-hoary tradition of fantasy gaming and the typical fantasy gaming narrative: a treasure is identified in its hiding place, a team is put together, they quest for success and victory and reward. The overall structure of the three main parts of the book is in fact inspired by what could be considered the traditional gaming adventure structure: a city sequence (establishing the adventuring group and its goals), a journey sequence through the wilderness, and then the dungeon sequence that acts as the denouement for our heroes—even if the events of The Barrow do not play out in the expected fashion. 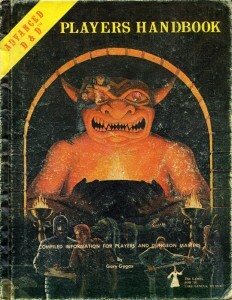 The Prologue is a deliberate homage to the front cover of the first AD&D Player’s Handbook, an oft-imitated and referenced image of two adventurer-thieves prying a massive gemstone out of the eye of a great demonic statue in a temple that has been successfully raided by adventurers; in AD&D terms I have always assumed the statue represented an efreet, and therefore that the temple was dedicated to elemental gods (perhaps even the Temple of Elemental Evil, as per the early TSR module; which oddly, I never played for some reason). Gods specifically tied to the elements (or more specifically to elemental planes as they exist in the AD&D cosmology) do not exist in the setting of The Barrow, so instead the shrine is dedicated to the Rahabi, the demonic spirits that serve the Lords of the Six Hells, and in particular to one of the demons called the Bharab Dzerek, spirits of iron and fire which, yes, probably look a lot like an efreet. In my readings of the old Monster Manual, it always seemed as though there were several creatures that were more or less exactly the same: the efreet, the pit fiend, and the “Type VI” demon—all of whom were, more or less, variations on a theme: the Balrog, still to this day one of the greatest foes ever introduced into a fantasy setting, with what I think is still one of the best names for same. So in the Known World I made it simple, there’s only one such type of creature, and they’re the Bharab Dzerek. There is, however, a very particular and rather obvious twist to the iconic PHB cover image: the addition of a long iron phalli/spear that juts out over the great brazier, and upon which the victims of the cult are skewered and sacrificed, to begin to mark for readers where The Barrow may start to divert from the traditional fantasy paths and tropes they might be expecting. In thinking about that cover, I was saddened to note that the artist who painted the original Player’s Handbook cover (and wrote and drew the classic Dragon Magazine comic Wormy), David Trampier, passed away very recently, on March 24, a few weeks after the release of The Barrow (I trust this was purely coincidental). He joins a number of other figures from the early days of roleplaying games that have passed in recent years, marking the age and maturation of the hobby, including patron saints E. Gary Gygax and Dave Arneson, coauthors of the original Dungeons & Dragons, and Bob Bledsaw, the co-founder of the company Judges Guild and the mind behind its signature setting, the Wilderlands of High Fantasy. 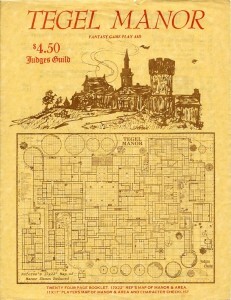 Many of those early adventures and writers—Bledsaw’s City-State of the Invincible Overlord and Tegel Manor for the Judges Guild setting; Greg Stafford’s world creation Glorantha (particularly the Lunar Empire; Nysalor, Thanatar, the cults of Chaos, and the Lunar idea of “illumination;” and the Joseph Campbell-inspired concept of heroquesting) for the game RuneQuest; the D&D adventure Dark Tower (which I believe is also the inspiration for the title of John Kovalic’s Dork Tower) and the RQ adventures Duck Tower, Hellpits of Nightfang, and Griffin Mountain, all by Paul Jaquays; the original TSR AD&D adventures The Village of Hommlet and Tomb of Horrors—have remained over the years my touchstones for archetypal gaming and gaming experiences. It’s hardly intended as its own meta-treasure hunt, but there are echoes of those books, games, and adventures scattered throughout both The Barrow and the Artesia graphic novel series as homages and references. 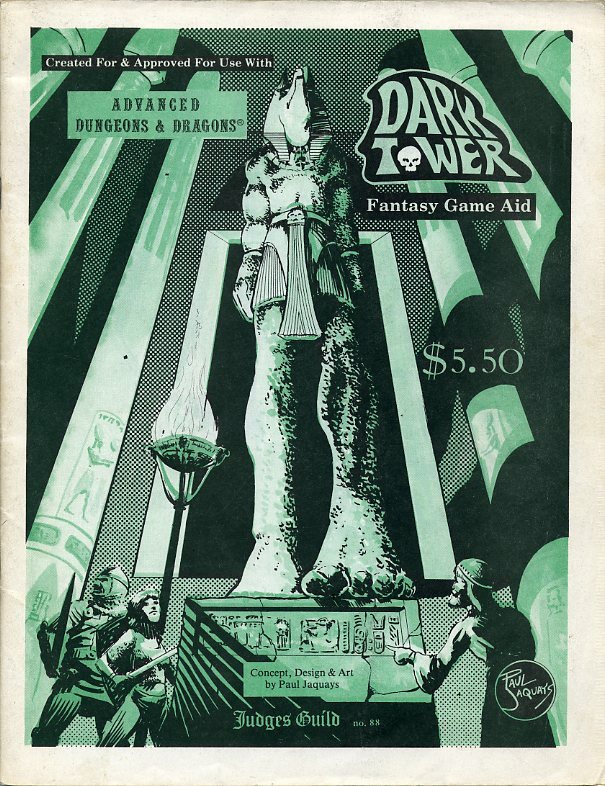 As one example, the character Arduin, brother to Harvald and Annwyn, was named after The Arduin Grimoire, a series of early D&D spinoff/expansions by David Hargrave, which were amongst the first gaming books that I encountered. The adventures and modules of the early days of roleplaying games had a certain crazed quality to them, a 1970s swords-and-sorcery vibe that marked them as different and unique (what nowadays Old School gamers might refer to as the original Appendix N feel). The world of The Barrow and the Artesia graphic novels is, I will freely admit, more rationalized, much more grounded, than the heights of vivid imagination to which some of those writers and works aspired (inspired, I suspect, by copious quantities of caffeine, amphetamines, LSD, and/or shrooms in varying amounts), and sometimes as a writer I find myself looking over some of the early work of the RPG industry to remind myself of the flavor that more grounded fantasy can sometimes lack. This is a very interesting and enjoyable essay. 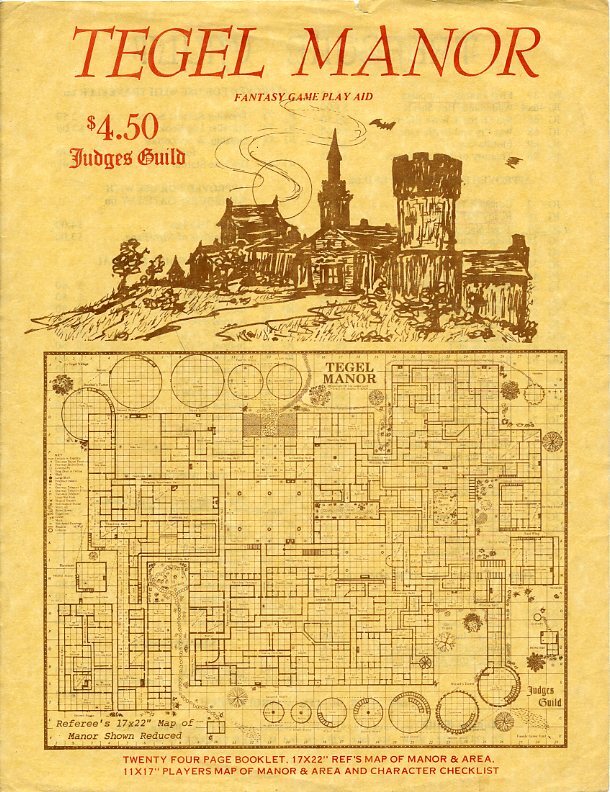 I wanted to note that the cover to the Dungeon Master’s Guide was actually done by Dave Sutherland, who also died a few years back. Sutherland was very influential in my early experiences with D&D. He did the cover to the first issue of The Dragon I ever bought, where he illustrated a scene from the first D&D novel, Quag Keep, by Andre Norton. I’m looking forward to reading the other essays! Hi Joe! Thanks for the correction, I will edit and correct the essay. For some reason I thought the same artist had done both covers (perhaps because they are both named Dave). I used to have a copy of Quag Keep but I’m not sure what happened to it. Do you remember what issue of The Dragon that was? Hi Mark! Since Sutherland and Trampier worked on so many projects together, it’s easy for their work to overlap in people’s memories. I sure do remember the Quag Keep issue of The Dragon, it was #12. I still have it in my collection. There is an excerpt from the book in that issue, with Sutherland doing an illustration from the story on the cover, and Trampier doing at least one interior illustration for the story (maybe several).